GFG Billy Farmhouse Escape is another episode of the point & click escape game series Billy Escape developed by GenieFunGames. In this game, your mission is to rescue the little boy named Billy - this time from a farmhouse. 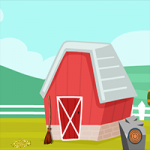 Find clues and objects and solve interesting puzzles to help Billy escape from the farmhouse. Good luck and have fun! unable to figure out triangles with numbers. Used the 2 numbers in torn paper on barrel but nothing happened? Any help would be appreciated. Thanks!